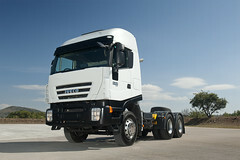 Single wheel van at 3.5 t GVW for urban and inter urban use. It can be compact and agile which makes it the ideal vehicle for commercial activities such as shops, laundries, electrical and plumbing maintenance services, cleaning companies and urban door to door transport. Within South Africa, it is often converted for use with the Emergency Services including Mobile Blood Clinics and Ambulances. It can also have a greater cargo capacity and volume - an ideal vehicle for inter urban and mid range transport, for delivery of domestic appliances or temperature controlled catering services.